Since the introduction of the landmark Global Warming Solutions Act of 2006 (AB32), California has reduced its GHG emissions by 11 percent. These results have been fueled by innovation on a number of fronts, including ambitious energy efficiency standards that have driven down emissions from buildings, and the Renewable Portfolio Standard (RPS) that set California on a rapid course to decarbonize electricity generation. Today, California is looking to expand its leadership—committing to achieve 100 percent RPS by 2045 (SB100) and aspiring to achieve economy-wide carbon neutrality in the same timeframe. These bold goals have sparked new discussions about how best to reduce GHG emissions from all sectors of the economy, including residential and commercial buildings, that today account for about 12 percent of GHG emissions statewide. Some policymakers have suggested that the best path to decarbonize buildings is to mandate that electricity replace natural gas for things like space and water heating, and even cooking. This overly simplistic view is costly and could take away consumers’ ability to choose affordable energy options for their homes and businesses. But California’s carbon neutrality goal doesn’t have to leave Californians with fewer energy options. Keeping energy affordable and inspiring rapid consumer adoption will be key to successfully reducing emissions in the building sector. A 2018 report released by the California Building Industry Association (CBIA) found that replacing natural gas in every home would cost California families up to $6 billion annually and require most buildings to undergo expensive retrofits. That’s an almost $900 increase in annual energy costs for every California family. Moreover, Californians prefer natural gas for heating and cooking by a margin of 5 to 1 because it is more affordable and reliable than electricity for those uses. In fact, only 10 percent of voters surveyed by CBIA would consider purchasing an all-electric home and 80 percent oppose laws that would take away their natural gas appliances. A recent study by Navigant Consulting demonstrates that we can reach our emission reductions targets in the building sector without costly mandates and without sacrificing consumers’ preference for affordable natural gas. The study, released earlier this year, shows that California could achieve emissions reductions equal to electrifying the entire building sector by replacing less than 20 percent of our traditional natural gas supply with low-carbon, or in some cases, even carbon-negative renewable natural gas (RNG) sourced from dairies, landfills and wastewater treatment plants. The use of renewable natural gas ensures that consumers continue to have the right to choose their energy, avoids building and appliance change-out mandates, and is three times more cost effective than any electrification strategy. All too often arguments about cost effectiveness and consumer preference don’t resonate in policy circles. But, ignoring these important considerations may result in higher energy costs for customers, and ultimately may even exacerbate the state’s affordable housing crisis. Rather than focusing on expensive plans for electrification, we should build on the success of existing energy efficiency programs and rapidly develop renewable natural gas for use in homes and commercial buildings. One of the success stories in energy efficiency is the development of the Zero Net Energy (ZNE) construction standard, in which a home produces as much energy as it consumes over the course of a year. Dual fuel ZNE homes are an effective, practical, and affordable way to reduce emissions and serve as a great example of how natural gas and electricity can work together to meet our energy needs and sustainability goals. The ABC Green Home 3.0 in Fullerton, California is a perfect example of this balanced, dual fuel design. The home combines A 3.7 kW rooftop photovoltaic (PV) solar power system with high efficiency natural gas appliances and the latest insulation techniques. The ABC Green Home has achieved an Energy Design Rating (EDR) of -0.6, meaning it produces more energy than it uses. This outstanding performance has been recognized by two prestigious industry organizations, winning the Pacific Coast Builders Conference “Gold Nugget Award” for Best Zero Net Energy Design and an “Outstanding Sustainable Engineering Project” Award from the American Society of Civil Engineers, Orange County Chapter. This balanced energy approach to home design allows builders to install smaller-sized PV systems, saving upfront costs. Using natural gas to operate appliances like space heating, water heating, clothes drying, and cooking also eases the reliance on grid electrical power at night when home energy consumption is at its highest and the solar PV output is unavailable. By continuing to invest in energy efficiency advances like dual fuel ZNE technologies and through the rapid development of RNG for use in homes and commercial buildings, we can achieve the significant GHG reductions set in our state’s bold vision without costly mandates that burden consumers and eliminate their choice. Of course, public policy can encourage people to reduce their personal carbon footprint, but preserving choice, providing options and minimizing disruption to people’s daily lives are all important strategies to inspire rapid consumer adoption. To help builders construct new homes with the natural gas appliances customers prefer and still achieve sustainability goals like Zero Net Energy, SoCalGas offers the Energy Efficient New Homes (EENH) Program and the California Advanced Homes Program (CAHP). Rebates are available now to builders of new single-family and multi-family homes who equip their projects with qualifying natural gas appliances and control devices. SoCalGas is Your Partner in the Clean Energy Future. 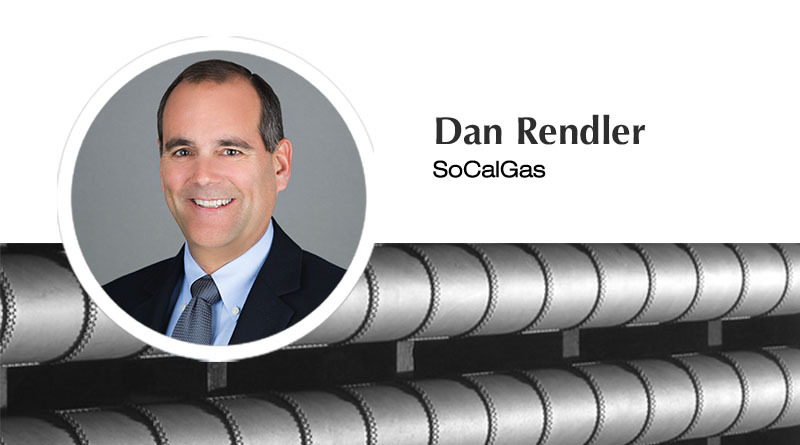 Dan Rendler is Director of Customer Programs and Assistance for SoCalGas and has over 30 years of experience in the energy industry.